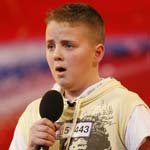 I was blown away by Andrew Johnston's performance, his audition in Britain's Got Talent 2008. I couldn't control my tears - not only because of his life story but also by his magnificent angelic voice! I am deeply touched with this video. It was my first time to witness this. This is totally amazing! Every time I watch this, tears just flow from my eyes like a river. This kid has a bright future ahead of him. His story must inspire a lot of people, not only to kids, but to all those who believe that they have talent. With this talent that God has bestowed on Andrew, he has already redeemed himself from other kids who have bullied him all his life. God really blesses those who are in need - those who seek justice & fairness. This is a must-see! Bravo, Andrew!!! Psalm 37: 4 - Delight yourself in the Lord and he will give you the desires of your heart.